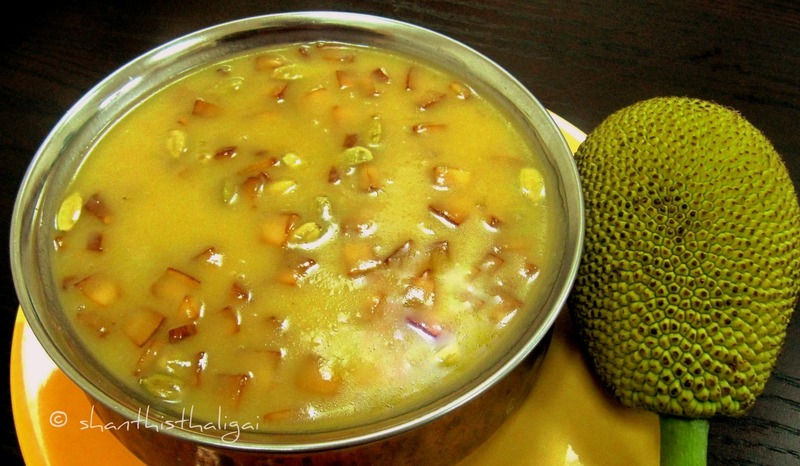 This is a pradhaman (kheer, payasam) popularly known as "chakka (jackfruit) pradhaman" served with the traditional Kerala Sadhya. WISHING YOU ALL A VERY HAPPY AND BLESSED ONAM. Fry the cashews and coconut pieces in a spoon of ghee. Keep aside. De-seed the jackfruit and pressure cook for 1 whistle. When cool, grind in a mixie to a fine paste. Measure this paste and take equal quantity of jaggery. Jackfruit paste, jaggery ratio is 1:1. Heat ghee in a pan, add jackfruit paste and stir continuously until ghee leaves the sides. Meanwhile, dissolve jaggery in little water, heat, remove scum, filter the dust and allow it to boil. Add this syrup to the jackfruit paste and mix well. In medium heat, stir continuously until the mixture thickens. When you see bubbles all around, simmer the stove to low flame and slowly add the coconut milk stirring continuously for a few seconds and turn off the stove. Add the ghee fried cashews, coconut pieces and cardamom. Chakka pradhaman is ready. NOTE: More jaggery can be added according to the sweetness of jackfruit. VARIATIONS: Chakka varatti is used instead of jackfuit paste. Milk is used instead of coconut milk. Looks very yummy and one of my husband's favorite payasam. Oooo... the payasam looks droolworthy!! The payasam looks so tempting delicious and inviting. Simply lip smacking. Delightful and delicious pradhaman..Fantastic dish Akka..
Celebrated onam every year of my life, but never made a jackfruit payasam. Looks tempting! Mouthwatering over your sweet.looks so good. Love this, especially with the coconut milk, simply delicious..